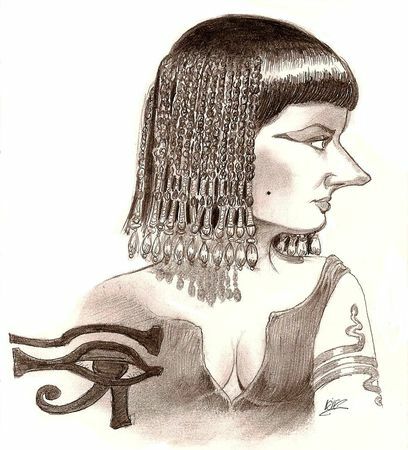 Most certainly the only Pharaoh of Egypt who would not allow depictions of herself from side view. She was famous during Antiquity for her bewitching beauty, but it's true that her nasal appendix was worth appearing in her mensurations. ( and anybody ) to govern Egypt alone. The tragic death of Ptolemy XIII, involving a passing crocodile, meant Cleopatra was henceforth Queen of Egypt. She moved on to a steamy liaison with Marc Antony, which enabled her to annex Syria, the south of Minor Asia and Cyprus to the Egyptian Kingdom, but also not to stay alone on saturday evenings. Then things went bad when opponents to Marc Antony led by Octavian entered the city. Facing no alternative, she and her lover resorted to suicide. Cleopatra, for the dramatic effect, chose to kill herself with the bite of a snake on her breast. Some of the filthiest creatures on earth can turn out to be very lucky.